We are in the midst of radical social and economic change brought on by the emergence of a global system that is completely and utterly uncontrollable -- it is too big, too fast, and too complex to control. Unfortunately, the lack of a global control system means that we face a long series of increasingly severe shocks (due to the system’s tight coupling, each new shock will sweep the world in months), wrecking long standing and established structures with ease. The first shocks, a bubble in energy and a financial crisis, have already done significant damage. More are on the way as the global system moves ever farther from normal patterns of operation. So, how does this impact the future of architecture and design? In general, this means that designers will need to focus less on macro or global level needs and much, much more on the needs of the local. Why? The solutions to macro level instability will be found in the development of local community’s that build systems and organizations that enable them to both withstand systemic shocks and prosper based on internal dynamics. This is nearly inevitable since architecture and design flow to sources of growth, and we will only see prolonged growth at the local and not the macro level. The first change will require architecture and design that transforms previously unproductive spaces – most residences and communities are black holes of productivity – into spaces that can produce value, from food to energy. A home, whether it is an apartment building or suburban residence, in 2025 will gain its value from its ability to efficiently produce necessities, and even income (as measured by the value of the output in local trade), for the owner. Community design will in turn focus on the creation of platforms that support and catalyze increases in production for the community as a whole. NOTE: For those that are unfamiliar with the concept of a “platform,” it finds its roots in the technology industry. Essentially, it is a system that simplifies a set of processes required for a given activity and bundles them into an easily accessible package. For example, the Internet is a platform. Platforms radically accelerate development and often foster the creation of diverse ecosystems of participants that rapidly innovate to fill the available opportunity/space. Within resilient communities, we will see the establishment of platforms that make it easier to grow/sell food, produce/share/sell energy, trade, share ideas/methods (social software), produce products (fab labs), collect/share/sell water and much more. For example, to accelerate the ability to share/sell energy within a community, smart grid technology and microgrids provide an excellent avenue of approach. More specifically, if my domestic wood-fired, combined heat power (CHP) system produces excess electricity, I could either sell it into the community's microgrid or store it locally depending on the pricing information I get from smart grid data flows. Another example would be platforms that support local agriculture. Platforms in this category such as vegitecture support localized agriculture and food production and include; centrally located open space for farmer’s markets, small fenced garden plots that can be rented, local cold storage, groves of nut trees, community composting systems, green roofs/walls and much more. If this sounds like a return to the 19th Century way of life you would be wrong. IF done correctly, the intensity of production and the productivity of participants will be orders of magnitude higher than during that earlier period. Further, IF done correctly it promises a rapid, broad and sustainable increase in standards of living for all participants. So, get ready and get innovating, for if we can crack the design of the models necessary to accomplish this, it will propagate virally across the entire world. Un point de vue qui est en train de monter et qui demande à revisiter les règles de la globalisation selon de nouveaux critères (durabilité, économies d'énergie, etc.). On entrevoit une sorte de société technolgique vernaculaire (ou comme mentionné ici, du XIXème). Le retour des saisons, de l'enracinement et de la distance? Comment combiner les gains intéressants de la globalisation (mobilité, écrasement des distances, créolisation ou métissage) à ceux du développement durable (économies d'énergie, durabilité)? Le théorien de l'"everyware" ou de la "sentient city" (autrement dit des probables évolutions de la ville en rapport à la dissémination des technologies IT dans l'espace urbain, architectural et personnel), Adam Greenfield, donc, ouvre un fil twitter public. Plus que le fil en soi, c'est l'utilisation de Twitter comme chaîne de communication par Greenfield qui est révélatrice: il est plus rapide de communiquer en 140 caractères de petites informations (des liens, des events) que de s'envoyer des emails ou de maintenir un blog. Certes, les objectifs sont différents et probablement complémentaires... De nombreux utilisateurs relatent un sentiment de présence des personnes qu'elles "suivent" à propos de l'utilisation de ce service. If we ever harbored the sentiment that Dubai’s dubious construction blitz would slow in times of economic unrest, the astronomical scale of the UAE’s latest project will surely dispel these qualms. Dubai’s largest developer, Nakheel, recently revealed plans for an entire archipelago of universe-themed islands at a $20 million dollar opening party for the Atlantis Resort. The cosmic string of strands will feature a sun, stars, and planets, and will be situated inshore of the already constructed World Islands. 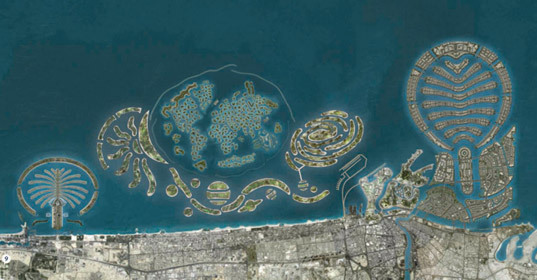 As if Dubai needed to further justify its status as an out-of-this-world tourist destination, the emirate has decided to step things up by constructing a universe-themed chain of islands. The Universe will comprise 3,000 hectares of land and will take 15 to 20 years to build. 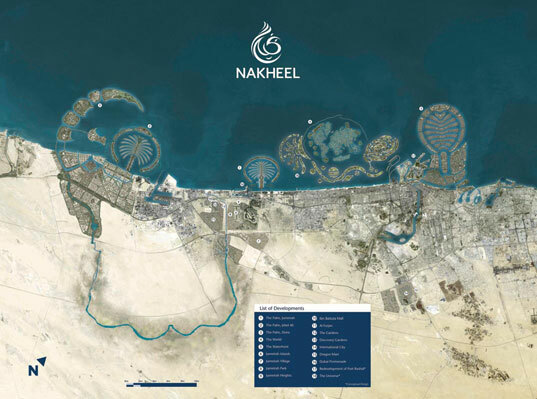 Curiously, the astronomical project was launched as part of Nakheel’s recently debuted Blue Communities initiative. The program promises cleaner water, less pollution, and claims that developments like the universe are designed to help maintain and protect the world’s coastlines. Using computer and communication applications to improve the rate and ease at which we work is something we write about often at Worldchanging (see more stories here, here and here). Applications like Twitter and Facebook not only help us stay connected within our networks; they are also beginning to help us harness the power of collective thought and action to re-imagine our world. The collaborative platform DIYcity is encouraging people all over the world to improve and create applications that could change the way we use current systems and infrastructure. To help generate more efficiency in our communities and activities, DIYcity is challenging applications creators and others to build and implement real solutions to problems like waste, transportation and traffic. Each week, DIYcity issues a development challenge to their readers to transform urban space and rebuild cities using tools like Twitter bots, aggregators, social software and mobile apps. Their first challenge, for example, asked people to innovate solutions to traffic using Twitter bots. Their first user-submitted app is Traffictweet, a Twitter bot from Andy Weissman that lets people broadcast current traffic conditions to others who are listening. It's pretty general, but works well, says DIYcity, just "subscribe to it, broadcast messages about traffic, and receive messages sent by others." You can build an application, but what DIYcity is really looking for in this challenge is a concise proposal. The more proposals, the juicier the collaboration will be! So submit your visions and ideas for improving rideshare applications to diy@diycity.org today! Collaborative platforms such as DIYcity help us come together to create the tools that we need to make our daily tasks a little easier, and to help us play a role in building the communities we want to live in. These tools give us the ability to imagine efficiencies for our cities that, in the long run, will make the places we live and the things we do more sustainable. Une tentative online pour structurer un effort participatif dont l'objectif est les développement des villes (américaines) de façon durable, en "bottom - up" et y appliquant les techniques de communication des réseaux sociaux, voir de l'"open source" et du partage d'idées. *I'm trying to imagine myself old, and feeble, and weak, and sick, and white-haired, and totally surrounded by mid-21C "Plectic Architecture." Obviously I've got it coming, I deserve that fate, but... maybe I'd be really *pleased and serene*. "Yes, this part is nanotechnological... and this is an old-skool Janine Benyus biomimicry riff here... and this useless Koolhaas junkspace where I keep my dialysis unit, that's where they goofed off doing Rhinoscript 'taffypulling.'" And then I take visitors over to the BDLGBLOG room where I've got a crumbling archive of the only stuff every physically printed out from BLDGBLOG. It's like Tut's tomb in there. It's like Otzi's autopsy table, and a cloud of plectic dry-ice pours out whenever I open it. Firstly it is important to stress that "Post-Digital Architecture" is not an architecture without any digital component. Indeed it an architecture that very much is a synthesis between the virtual, the actual, the biological, the cyborgian, the augmented and the mixed. If we start to think of the architecture in this book (((there's a book? Hey wait, wow, I need that book))) as the first stirrings of a Plectic post-digital Architecture, then Murray Gell-Mann's, mid nineteen eighties definition, of "Plectics" seems a suitably broad umbrella within which to situate it. Such terrain can include a variety of complex sub cultures of architecture that are all composed of differing degrees of the digital, the virtual, the biological and the nanotechnological, interaction and reflexivity without banishing the more off piste and often less fashionable investigations, propositions and researches. Bruce Sterling relate l'évolution du M-Arch "AVATAR --pour Advanced Virtual And Technological Architecture Research--" de la Bartlett School of Architecture de Londres (un très bon cursus): le master passe au "post-digital", non pas parce qu'il n'y a plus de digital, bien au contraire, mais parce "qu'il n'y a plus de distinction binaire possible entre digital et physique, virtuel et actuel, etc." "Les éléments sont dorénavants entremélés" et le master vise à "une architecture qui cherche la synthèse entre le virtuel, l'actuel, le biologique, le cybernétique, l'augmenté et le mixte."